Who says that a smaller car has to be boring? Who says that a crossover SUV has to be expensive? Definitely not Fiat! With an great mix of Italian styling, surprising performance, and the available all-wheel drive capability you need to get out there and find adventure, the 2019 Fiat 500X is the crossover is the roomy, capable crossover that’s really going places! Starting at just $19,995, it’s a bargain too! Ready to buy a 2019 Fiat 500X in Fayetteville, Springdale, Bentonville or Rogers? 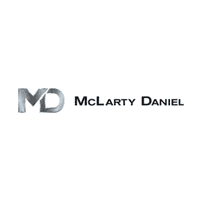 Then stop in soon at McLarty Daniel Chrysler Dodge Jeep Ram Fiat, or check out our selection of new Fiat vehicles online right now! SLEEK EUROPEAN DESIGN: While other small crossovers only manage to look like a slightly bloated rollerskate, the 2019 Fiat 500X benefits from Fiat’s world-renowned design studio, for a look that is perfectly proportioned, with a sophisticated, Euro flair. Athletic styling is built into every line and curve of the 2019 Fiat 500X, which features muscular front and rear fascia, high-set projection beam headlights, and a generous ground clearance to help you reach outdoor adventure. It’s all available in ten bold and eye-catching colors, with your choice of attractive alloy wheel designs on each of the 2019 Fiat 500X’s five unique trim packages, which include the 500X Pop, Trekking, Urbana, Lounge and Blue Sky. AN INTERIOR THAT IMPRESSES: While the interiors of many compact crossovers don’t exactly set the world on fire, the 2019 Fiat 500X is a delight for the senses, thanks to more of that groundbreaking Fiat design. Settle in to comfortable, sculptural seats featuring the Fiat 500 logo in silver, with unique round headrests set on polished chrome stanchions. Let some light in for both front and rear seat passengers, with the available dual-pane power sunroof. Need to haul more than people? The 60/40 folding rear seat lays flat to create a large cargo floor for long or bulky items, or even a sleeping bag or two if you need a home on wheels while road-tripping. SURPRISING PERFORMANCE: Ready for some get up and go? The 2019 Fiat 500X has plenty of it, thanks to the 1.4-liter MultiAir 2 turbo four-cylinder. 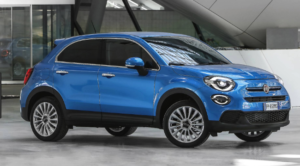 Standard on the 2019 Fiat 500X, the engine produces a zippy 160 horsepower and 184 lb.-ft. of torque, for confident acceleration and merging, while delivering a budget-friendly 33 miles per gallon on the highway for a driving range of 419 miles on a single tank. The engine is backed by Fiat’s advanced nine-speed automatic transmission. Underneath the 2019 Fiat 500X features an advanced MacPherson strut suspension, and twist-beam rear suspension, with KONI frequency selective damping. For sure-footed traction even when the weather isn’t cooperating, check out the available advanced all-wheel drive, which disengages automatically when traction needs are low to save gas. Ready to buy a 2019 Fiat 500X in Fayetteville? Of course you are! Then it’s time for you to come see us at McLarty Daniel Chrysler Dodge Jeep Ram Fiat of Springdale, Northwest Arkansas’s only Fiat dealership! Stop in today to check out our big selection of Fiat vehicles, or check out our full selection online right now.